(1) An equation has two sides that are equal. 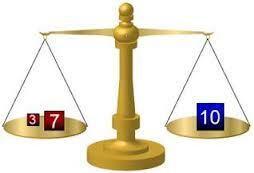 (2) When the same quantity is added to, or subtracted from, the two sides, the equation is maintained. (3) When the two sides of an equation are multiplied or divided by the same quantity, the equation is maintained. (4) When the equation is made up of two equal expressions, and a term is moved from one side to the other side, its sign changes to the opposite. That is, + becomes –, and – becomes +. (5) When the equation is made up of two equal terms, and a factor is moved from one side to the other side, then multipication becomes division, and division becomes multiplication. When working with word problems, we first translate the word problem into an equation, using a letter to represent the unknowm. We then bring the unknown to one side of the equation, and all the knowns to the other side of the equation using the rules of transposition. EXAMPLE: 3 more than 5 times a number is 13. What is that number? We first transpose the term 3 to the right. Addition becomes subtraction. Then we transpose the factor 5 to the right. Multiplication becomes division. The answer is N = 2. We verify the answer by substituting it in the equation. The answer N = 2 is correct. EXAMPLE: If 5A – 6 = 14, what is the value of A ? Verify by substituting 4 for A in the original relation. EXAMPLE: Determine the value of A if 7A / 3 + 4 = 18. Verify by substituting 6 for A in the original relation.